We've Shortlisted 10 *Stunning* Beauty Looks For The Bride... Which One's Your Favourite?! Pink is one colour which suits almost everyone. It’s not as dark as red, but still quite bright and pretty and thus makes for a perfect bridal colour. 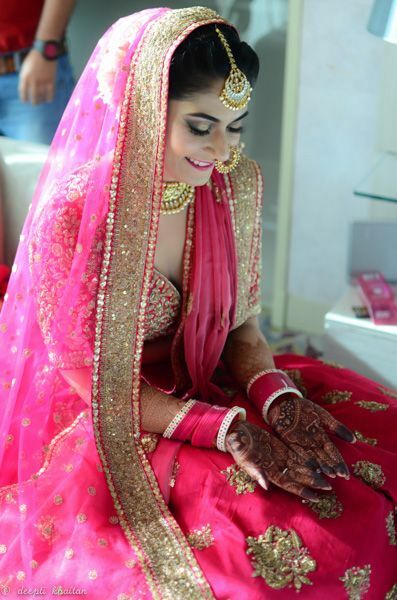 This stunning bride opted for a pink outfit for her wedding and her make-up was just right and in line with her lehenga. Her look was subtle and minimal, which complemented her heavy jewellery really well. Get a similar kundan maangtika on Amazon for Rs 499. 2. Red and golden is the best combination or what! We love this pretty one’s bridal lehenga, with the subtle golden dabka work and the blush pink dupatta paired with bright red. Her jewellery is matching her outfit well, and we are totally in love with her bold red lipstick that is such a great contrast to her dramatic smokey eyes. Just the kind of look you should opt for if you have a night wedding. You can never go wrong with a perfect red lipstick, and what better colour than MAC Ruby Woo when it comes to bridal makeup. Buy it on Nykaa for Rs 1,500. 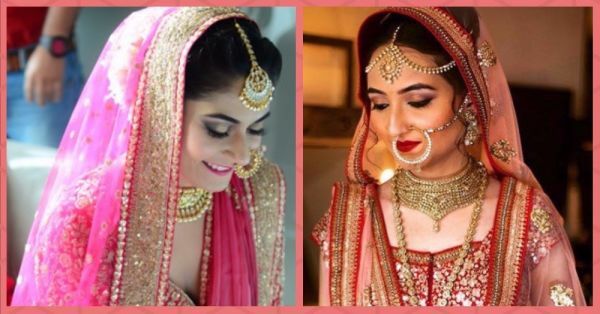 Looks like the trend of matching your make-up exactly with your bridal outfit is not too out of fashion yet, and after looking at this beautiful blushing bride, we cannot even complain. 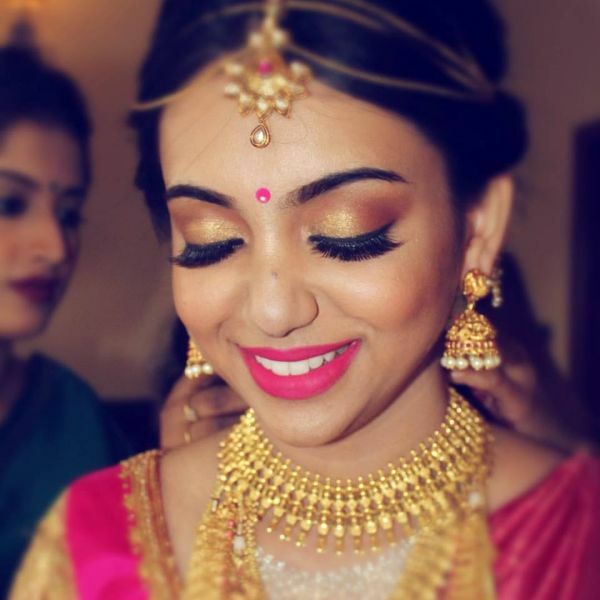 She wore a pink and golden saree for her wedding, with really heavy jewellery (oh how we love her mathapatti!) But what we completely loved about her look is her matching pink lipstick, bindi and her gold and pink toned eyeshadow. Looks great, doesn’t it? 4. Nothing beats the power of red! 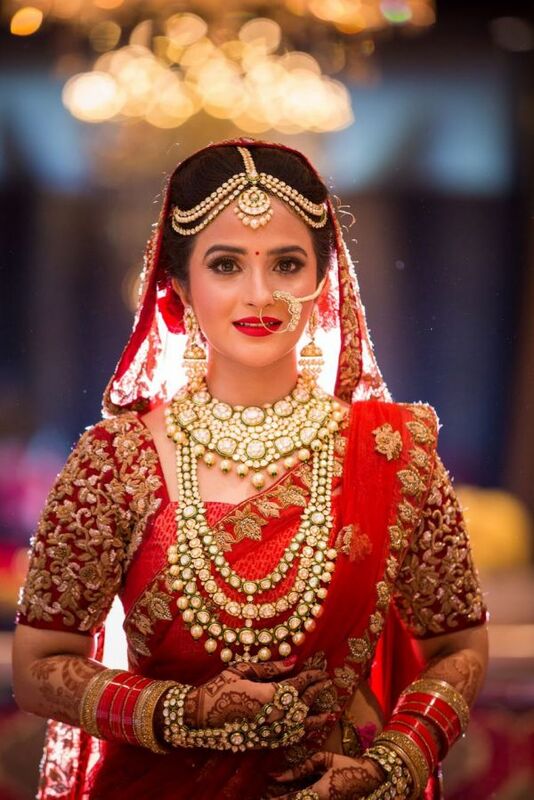 A bride and the colour red are two things which can never REALLY be considered as two separate entities. 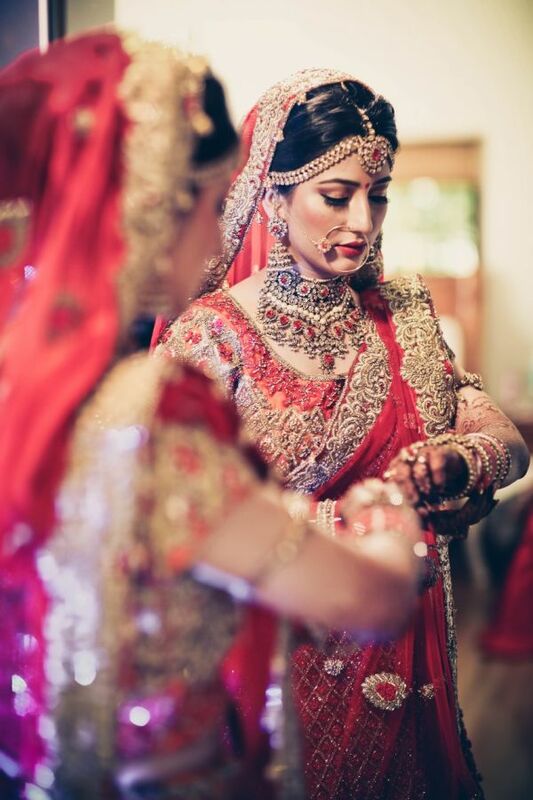 This regal looking dulhan opted for an extremely heavy red and gold lehenga, with some stunning statement jewellery. And since she had already opted for a extremely heavy outfit and jewellery, she went really minimal with her makeup and we are so smitten! It’s always a good idea to balance out your look like that. Bridal beauty on point! 5. Like we just said, red is BAE! Red is one thing but bright red takes it to a different level altogether. 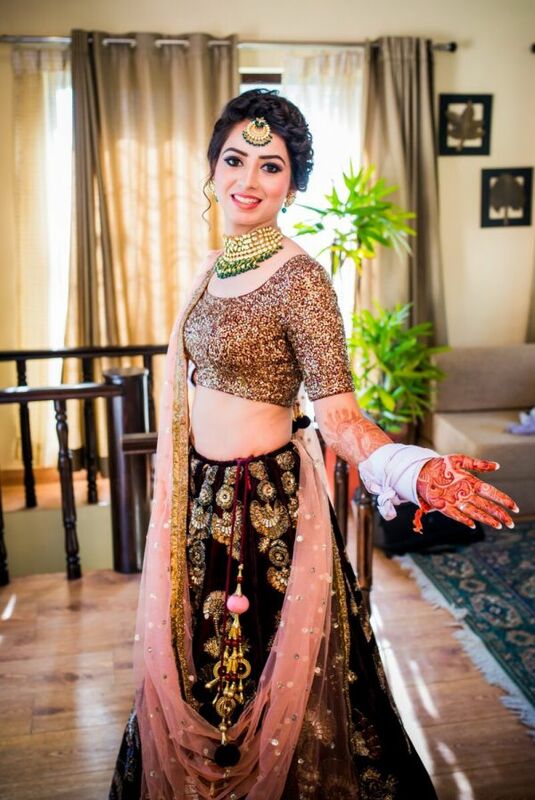 This gorgeous bride picked a super heavy lehenga with equally gorgeous layered jewellery for her D-day. Her makeup was on point and complemented her look pretty well. 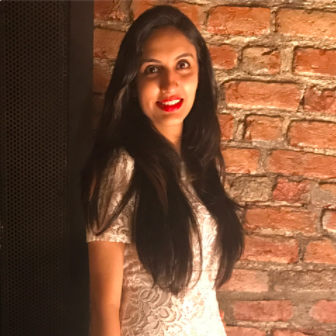 Her ‘all red’ avatar is something which not everybody can pull off, but if it’s your cup of tea too, then you should definitely go ahead with it! Ooh that pretty nath, though! Get a similar one on Amazon for Rs 349 only!!! 6. Don’t hold back on the bling! 7. Because your eyes can do all the talking! Oh yes, they do, and especially a bride’s eyes. You just have to make sure that your eye make-up is on point on your D-day. This bride went for an overall subtle look - a peach lehenga, simple dewy make-up, but she matched this demure look with really bold eyes and we sure loved it. That's just legit bridal makeup goals! Burgundy and wine coloured lips are all the rage for brides this season. 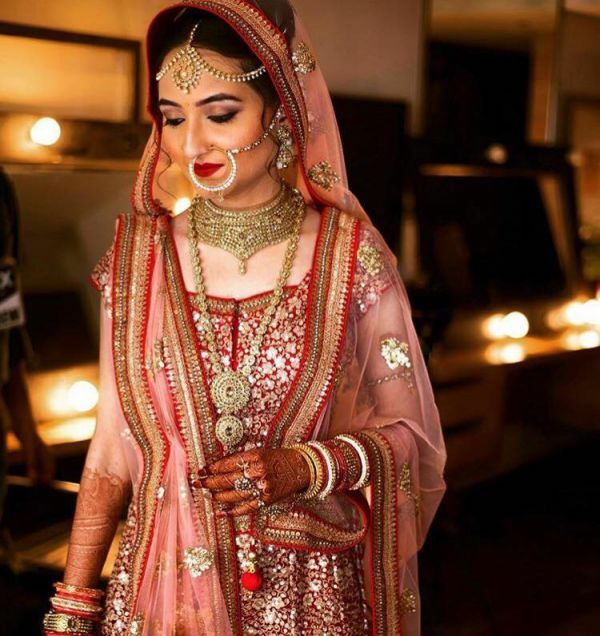 This beautiful bride who wore a light pink bridal outfit for her wedding, went for chunky jewellery with it and a really bold wine coloured lipstick. Her cheeks had a bit of a pink tint and eyes had a soft-smokey look, which further accentuated her natural bridal glow. Her bridal make-up artist did a great job, we must say! This cutesy bride wore a gorgeous golden outfit studded with dark blue crystals and matching jewellery. But what stole the show were her eyes, which were decked with a beautiful midnight blue coloured shimmery eyeshadow. Stunning, is all we can say! Don’t you just love the stunning royal blue eyeshadow this pretty bride is adorning. Get a similar shade from MAC for Rs 1,400. It’s available on Nykaa, where else! First and foremost, we are in LOVE with her outfit, especially the colour combination. The marsala coloured lehenga, paired with a glittery gold choli and a blush pink colour dupatta - just wow! The bride did the right thing by keeping her make-up subtle, so as to not steal the limelight from her princessy bridal outfit. Bridal beauty goals, much? Also, here's a list of total must-haves in your bridal beauty kit, as revealed by our FAV MUAs! So, now that we have given you our top 10 beauty looks for the bride, which one is your favourite?